Honolulu, Hawaii — Maluhia hosted special events at its Alewa Heights campus in honor of National Nursing Home Week, which began on Mother’s Day, May 9, and continued through May 14. This year’s theme, “Enriching Every Day,” recognizes the ways patients, caregivers and volunteers alike enrich not only one another’s lives but those of the communities through the relationships they build and the dedication they extend to each other every day. In celebration of National Nursing Home Week, many events were scheduled at Maluhia, including: the Resident Council Bake Sale on Monday, May 10; Coffee Hour and Bingo on Tuesday, May 11; Continental Breakfast and Entertainment by Nursing and others on Wednesday, May 12; Ice Cream Social on Thursday, May 13; and TGIF Party, Friends of Maluhia Drawing and Scavenger/Trivia Contest on Friday, May 14. 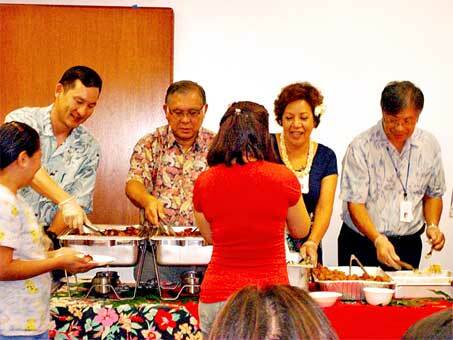 “Maluhia uses this week as a celebration of its residents, to honor its dedicated staff and volunteers, and to reaffirm our commitment to provide quality, resident-centered health care,” said Vincent H. S. Lee, chief executive officer, HHSC Oahu region.